Availability: Expected to ship on or about 06/08/19. 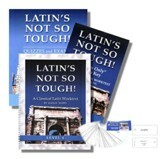 Teach your children classical Latin with Latin's Not so Tough! This Level 4 kit is the fourth of six levels that together will bring students to a thorough knowledge of vocabulary, grammar, and Latin translation. The workbook features principle parts, the first through the fifth declension and conjugation, new vocabulary, principle parts of verbs, macrons, syllables, and accents, the ablative of accompaniment, and more. Keyed to the workbook level and page, the flashcards feature a word or conjugation clue with the answer and page number on the back. These flashcards are printed on thin cardstock, and are the same as the pages (on normal paper) that are in the back of each workbook. Cut and hole-punched, a ring and plastic storage bag are included. 244 cards. 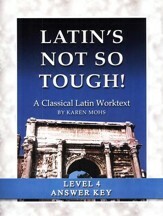 Latin's Not So Tough Full Text Answer Key, Level 4, 196 pages, spiralbound softcover. Keyed to the workbook level and page, the flashcards feature a word or conjunction clue with the answer and page number on the back. These flashcards are printed on thin cardstock, and are the same as the pages (on normal paper) that are in the back of each workbook. Cut and hole-punched, a ring and plastic storage bag are included. 244 cards. Languages need constant practice in order to "stick." 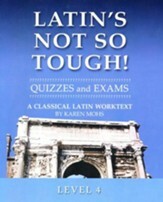 This worktext provides the lessons for "Latin's Not So Tough" Level 4; word-bank, fill-in-the-blank, conjugation, translation, and definition exercises are all provided, helping children learn both the grammar and vocabulary of Latin. Lessons cover principle parts, the first through the fifth declension and conjugation, new vocabulary, principle parts of verbs, macrons, syllables, and accents, the ablative of accompaniment, and more. 195 pages, spiralbound. Sheets of flashcards (which the parent will need to cut out) are included in the back. 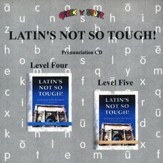 This set of quizzes and exams accompanies Greek'n'Stuff's Latin's Not So Tough Level 4 Workbook. Four quizzes, a comprehensive midterm and a comprehensive final are included. Translation exercises, grammar questions, vocabulary identification, and conjugations are tested. Answers provided on overlaid tests in the back; parents are supposed to cut out the tests. 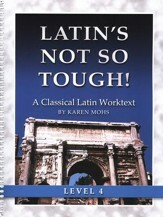 This worktext answer key accompanies Greek'n'Stuff's Latin's Not So Tough! Level 4 Workbook. An overview of the lessons provides tips and hints for teachers before moving into the answer key. Just like the workbook, pages are arranged by type of exercise, not by complete lesson. Answers are overlaid on full-size reproductions of the student pages. 196 pages, spiral-bound softcover. 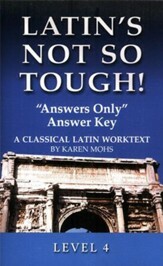 This short "Answers Only" key is a small booklet referencing the sold-separately Latin's Not So Tough! Level 4 Workbook page numbers and the line-listed answers for each page. Paperback. Level 4. Practice your Latin whenever you have a spare moment, whether you're at home or on the go. Keyed to the workbook level and page, these Level 4 flashcards feature a word or conjugation clue (i.e. "second declension neuter [plural]) with the answer and page number on the back. These flashcards are printed on thin cardstock, and are the same as the pages (on normal paper) that are in the back of each workbook. Cut and hole punched, a ring and plastic storage bag are included. 244 cards, each approximately 4.25" x 2."